For people named Kettlewell, see Kettlewell (surname). For the Rottentroll character "Kettlewell", see Roger and the Rottentrolls. Kettlewell is a village in Upper Wharfedale, North Yorkshire, England. Historically part of the West Riding of Yorkshire, it lies 6 miles (10 km) north of Grassington, at the point where Wharfedale is joined by a minor road which leads north-east from the village over Park Rash Pass to Coverdale. Great Whernside rises to the east. It is believed that the name Kettlewell is Anglo Saxon and comes from Chetelewelle which means a bubbling spring or stream. Signs of the farming methods of Romano-British and early medieval agriculture can still be seen in terraced fields to the north and the south of the village. In the 13th century a market was established in Kettlewell, which became a thriving community. The Thursday market mostly sold corn outside the King's Arms. Textiles (and, in the late 18th and early 19th centuries, lead mining) revitalised the village and Kettlewell's appearance today derives much from its past 200 years. The remains of the smelting-mill, used from 1700 to 1880, can be seen near the meeting of Cam Gill and Dowber Gill Becks half a mile above the village. In 1686 Kettlewell and Starbotton were almost destroyed in a flood. Heavy rainfall descended on the adjacent hills and cascaded down into the village demolishing several houses and causing the residents to flee. On 5 July 2014, the Tour de France Stage 1 from Leeds to Harrogate passed through the village. The village is part of Kettlewell with Starbotton parish in the Craven district of North Yorkshire. 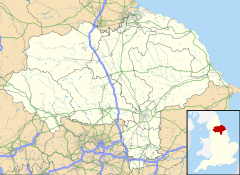 The village is in the parliamentary constituency of Skipton and Ripon, the seat has been held by the Conservative Party ever since its creation in 1983. Kettlewell Beck joins the River Wharfe in Kettlewell. Kettlewell is situated in Upper Wharfedale around two miles upstream of where it converges with Littondale. The B6160 crosses the River Wharfe by a stone bridge. The village is situated just west of the confluence of Dowber Gill Beck and Cam Gill Beck, which join to form Kettlewell Beck flowing through the village to join the River Wharfe. There are many small bridges across Kettlewell Beck which dissect the village. A disinfectant-bath in Kettlewell during the 2001 United Kingdom foot-and-mouth outbreak. Historically Kettlewell's economy revolved around lead mining and farming. Farming was adversely affected by the 2001 foot-and-mouth outbreak. There are several farms which mostly rely on sheep farming. There is a small service economy serving village residents, tourists and walkers. Kettlewell is on the Dales Way and is a popular starting point for ascents of Great Whernside and Buckden Pike. Rights of way connect the village to Nidderdale and Arncliffe in Littondale. The village pubs are on the Inn Way and the Racehorses Hotel and the Bluebell Inn provide accommodation. The village has three inns; the Racehorses, the Blue Bell and the King's Head, numerous guesthouses, holiday cottages and a village shop, an outdoor-pursuit shop and filling station with a mechanic's garage. There is a large YDNPA car park and the National Park Authority operates public conveniences adjacent to the main car park. The village has 17th and 18th century houses, including the vicarage. The church, St Mary's, as we see it today was rebuilt during the 19th century and stands on a site that dates back to 1120 when the (Norman) de Arches family established a church here. An example of 20th century architecture is the 1960s-built chapel at Scargill House, which is now a Christian conference centre. Kettlewell is connected by bus to Skipton, Grassington and Buckden. The area is known for Swaledale Sheep which are extensively farmed in the area. There are deer in the area, though these are rarely sighted. There are areas of forestland to the south-east of the village, while the open valley to the north has little tree cover. In August the village hosts a scarecrow festival where scarecrows, dressed up as different characters are placed around the village. A children's television character from The Rottentrolls takes its name from the village. 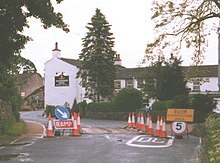 Kettlewell represented the village of Knapely in the 2003 film, Calendar Girls. ^ "Amerdale Cottage". Amerdale. 2011. Retrieved 7 April 2011. ^ "Kettlewell Name". Amerdale. 2011. Retrieved 7 April 2011. ^ "Conservation Area Appraisals" (PDF). Yorkshire Dales National Park Authority. 2011. p. 16. Archived from the original (PDF) on 22 October 2015. Retrieved 23 November 2015. Wikimedia Commons has media related to Kettlewell.